David Austin, renowned English rose expert, created a rose of singular fragrance for Crabtree & Evelyn's signature perfume - 'Evelyn'. 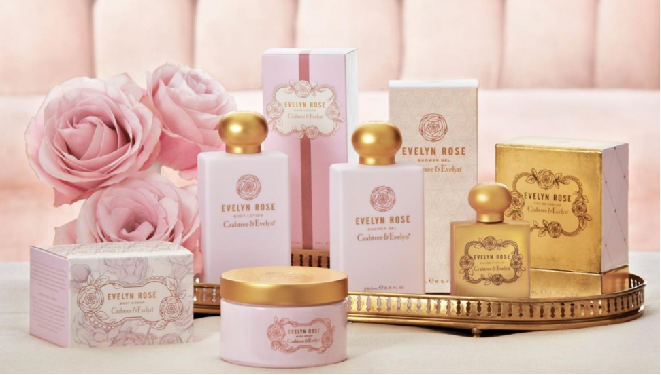 At the heart of this captivating, feminine collection is a formula that combines hints of delicate velvety petals from Crabtree & Evelyn’s exclusive rose blend with a beautiful selection of old world English roses. The top notes have fresh juicy citrus accords while the base is provided by subtle warm amber and musk. The Evelyn Rose collection comprises of hand cream, shower gel, body cream and lotion, soaps and EDP. The entire collection is beautifully packaged and presented with illustrations inspired by the beauty that is rose. It seems the Evelyn Rose range was given a subtle yet complete overhaul in the recent years. I have not tried the earlier version of the Evelyn Rose EDP so obviously cannot compare the two versions. But this current EDP, I feel, is a very fresh and modern take on the rose scent. It opens beautifully, is slightly sweet (not overpowering) and is a fresh and true rose scent. I like how it feels sophisticated without being very heavy or synthetic. A lovely and clean rose fragrance. I like the luxurious gold packaging as well. In my opinion, if you love florals, you will like this scent. Crabtree & Evelyn are hoping to raise over £5,000 for Breast Cancer Care this October. Breast Cancer Care are a specialist breast cancer support charity working throughout the UK. They provide training, support and networking opportunities to specialist breast cancer nurses in addition to supporting millions of women and their families through their face-to-face, phone and online services. and not merely the absence of disease or infirmity.